“Tigers can only be protected if the people who live with tigers do not bear the cross of being the predator's neighbours.” - Prerna Singh Bindra. India’s tiger protection strategy is often accused of divesting forest-dwelling communities of their rights to forest land and outlawing their use of critical tiger habitats, thereby excluding them from the conservation dialogue. The lives of many tribes are inextricably linked with the forest and they are heavily dependent on the gathering and sale of forest produce such as mahua, tendu, wild fruits and firewood. It is not uncommon for them to venture into core areas of the forest - critical tiger habitat and inviolate conservation spaces - where they find themselves in conflict with forest authorities. And then there are buffer zones: important sites that separate critical animal habitat from villages and shield wildlife and people from each other. But, buffer zones are tense, shadowy spaces; shared territories where encounters between man and animal are not uncommon. In the buffer, wandering animals that pose threats to human lives, crops and cattle are in danger of being killed in retaliation. When Nikhil Nagle founded Last Wilderness Foundation in 2009, he chose buffer zones around tiger reserves like Bandhavgarh, Kanha and Panna - to conduct nature conservation education among communities living in and around the villages that include the Gonds and the Baigas. People living on forest fringes are in a constant tussle with the Forest Department and the animals. “They accuse forest officials of siding with the forest and the animals at the cost of human welfare, due to the stringent protection measures in place” says Bhavna Menon, Project Coordinator at Last Wilderness Foundation. This sentiment of abandonment runs deep, often manifesting as apathy towards the animals and their protection. But, the NGO believes that tiger conservation is impossible without the inclusion of communities living around tiger reserves. This means changing how people perceive their environment and their role within it by interacting with it differently. The organisation also sees itself as an intermediary between the Forest Department on the one hand and the locals on the other - beginning with the children - the future custodians of these wild spaces. On the day of the safari, the children of the village queue up outside the vehicles, waiting eagerly to clamber in and head inside the forest. Their senses heightened, they listen keenly for bird and langur calls, prime themselves for changes in temperature and smell, and keep their eyes peeled for telltale signs in the landscape. But nothing can quite prepare them for the sight they’re about to behold: a male tiger strides magisterially across the path, a few feet away from them, with but the slightest nod in their direction. The children are riveted! Their long silence reverential. As the stripes slowly melt into the trees, a hushed chatter of “Usne to kuch bhi nahi kiya,” (It didn’t do anything to us) and “Kitna sundar tha!” (How beautiful it was) rises to break the quiet. Many in the group are visibly moved, others are frozen in thought. The reactions upon spotting a tiger in the wild are what unite people, Bhavna says. Take the case of Gullu Singh who lived all his life in the buffer but went into a paroxysm of ecstasy when, on his maiden safari at 83, he sighted a tigress with 3 cubs. When people see the animal in its natural habitat, as a denizen of the forest rather than the vicious man-eater or thieving intruder they perceive it as, they begin to see faint possibilities for coexistence and even open up to the idea of protecting it. 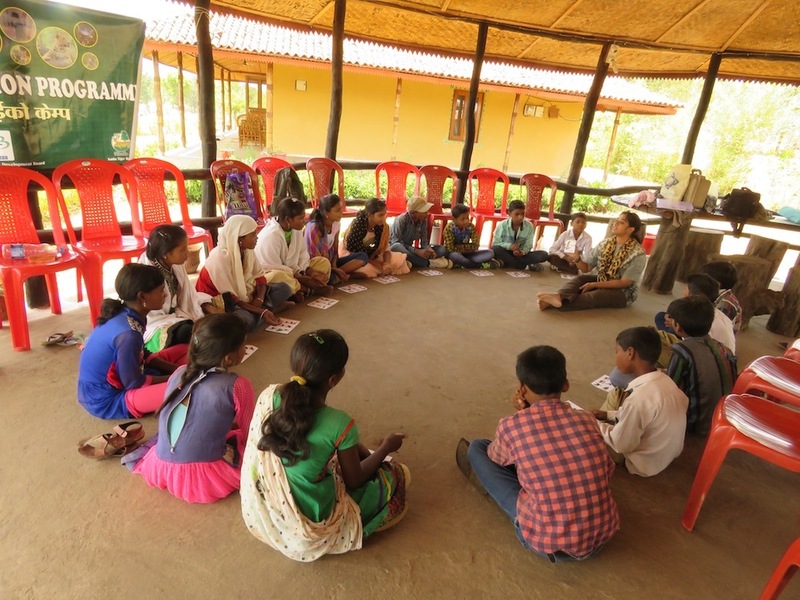 Once the children’s interest has been sparked, the NGO maintains regular contact with the schools and children with the help of posters, books and games like Wildlife Bingo that inform them about India's biodiversity and sensitise them to it. They learn about the intrinsic value of forests, and the link between tiger conservation and human survival. They become aware of environment-friendly practices that could reduce the risk of forest damage and minimise man-animal conflict, such as refraining from burning forest patches for forest produce collection and reducing the time spent in the forest. “When children started coming into the forest on safaris, they saw it with fresh eyes, and a whole lot began to change in their attitudes towards it,” Bhavna observes. From sharing a transactional relationship with the forest, they now see the delicate interconnectedness of its different elements and its role in their well-being. They also begin to appreciate the work of forest guards to maintain peace between people and animals. “If tigers came into villages, it was common to hear, ‘Your tigers are coming into our village. Keep them inside your forest’,” says Bhavna. Today, following numerous interactions with forest staff, there are instances of locals supporting forest guards by assisting them in mitigating incidences of conflict. On the safari, children interact with tourists and share their knowledge about the region. This is instilling a sense of ownership and pride about the special place they live in and their role as caretakers of the place. However, the transition is never smooth or absolute and hard-won gains can be fleeting in the absence of avenues for sustained change. 17-year-old Pushpendra Pardhi explains this knotty situation best. He belongs to Panna’s nomadic Pardhi tribe, a fringe community accused of poaching India’s tigers to the brink of extinction. He says, “We’ve lived in the forest and hunted for a living for 150 years until in 2007, hostels set up by the Panna tiger reserve opened up the prospect of education for us.” We may complete school, he says, but the social stigma and marginalisation that’s come to be associated with their former way of life is hard to shrug off; it is difficult for Pardhi youth to find jobs, forcing them to fall back on traditional skills and occupations. The conservation question is fraught with conflicting opinions on the position of forest-dwelling communities. While tribal welfare organisations push for honouring the rights of tribals to forest lands within the boundaries of reserved forests, many conservationists rally for stricter protection of critical tiger habitats free of human activity to allow for regeneration of the species. While there are no easy answers, LWF is working middle ground, trying to put the ideal of ‘harmonious coexistence’ within easier reach. They believe that only by harnessing native knowledge on wildlife for conservation and including locals in the conservation dialogue can any headway be made in protecting the last of our big cats. After all, you and I are just passersby; they are the people of the forests and its keepers; those who cohabit these wild spaces with the tiger and depend on its survival for theirs. LWF accepts volunteers to help out with the VKAP. Apply here for the upcoming season.